In September of 1944 the RLM held a competition for the Volksjäger, a simple fighter that could allegedly be flown by relatively inexperienced pilots. The key was that it had to be made of mostly non-strategic materials (as in steel and wood) and the first prototype to be ready in about three months. Well, this competition was won by Heinkel with the He-162, but there were a number of other entries. Blohm und Voss, who were well known for building submarines, flying boats and unusual design aircraft (like the Bv-141) entered the Projekt 210, a swept wing tailless design. The initial design (P.210.01) was the wider of the two designs and had a multi-framed canopy. This was later simplified into a smaller airframe, the P.210.02. To be powered by a single BMW 003 turbojet and armed with two 30mm Mk 108 cannon in the nose it was hoped to have a speed fast enough to evade enemy jets. In any event, it was discovered that the amount of extra speed given by heavier swept wings wasn't worth it and the P.211.02 design with straight wings and a standard tail (in fact it looked very much like a powered BV-40 glider) would have been nearly as fast for a lot less weight. Eventually the point was moot as the competition was won by Heinkel, probably to the relief of B&V designers who really didn't want to enter the competition in the first place! Here we have another Anigrand molded kit and it is not a large one, being nearly lost in the large box in which it arrived. 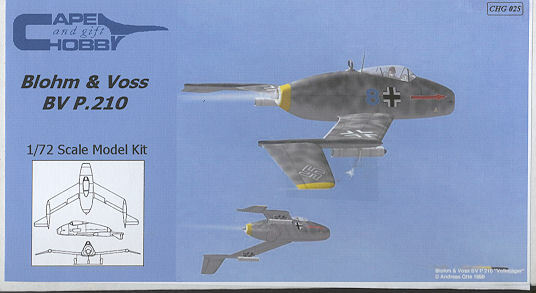 This kit seems to be the P.210.01 as it has the multi-pane canopy and seems a bit broader on the bottom compared to the drawings of the P.210.02 in the reference. As is the norm with Anigrand kits, there are molding faults that will need corrected, including a rather large blob of stuff on one fuselage half at the cockpit instrument panel area. It is almost as if a portion of the fuselage melted a bit. Filler to the rescue on this one. I also found both of the tail planes to be somewhat abbreviated at the tips; one with chunks in it and the other seems slightly short-shot. Neither is difficult to repair (in this case plastic card is the best choice), but adds some extra work to the build. Biggest problem will be finding a place to put nose weight as there really isn't much room. 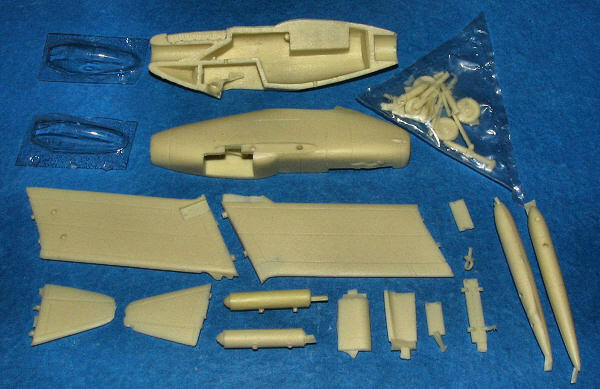 I did a similar 1/48 kit from Pend Orielle and had to cram the nose with weight to keep it from tail sitting. Test fitting a few bits showed a good fit. There are alignment pins to help and the tail planes have pins of a different distance apart to keep from putting them on wrong. You'll have to drill out some holes in the small resin 'bullets' as some are filled in. Because the landing gear is short and pretty straight, there should be no problem from resin warping over time. There are also some either rocket pods or rocket take off units that fit under the wings (those thingies in the lower center). CHG is kind enough to supply two vac canopies so you can goof one up. I had to hu nt around to find them both in all the plastic peanuts that came in the box. Instructions consist of several pieces of inkjet printed paper. One is a short history and the others are images of the kit during several stages of construction. This works out quite well for assembly as it does show where everything goes. A generic insignia sheet is included, though you may want to hit the spares bin as most of these seem a bit large for the kit. This is a great kit to start off a collection of resin kits. Though it will exercise those modeling skills, especially if you are used to a steady diet of Tamiya kits, you'll be able to build something rather unique and will have a model you'll be pleased to have finished. I'm pretty jazzed by the kit and what Cape Hobby has been offering to Luft '46 fans. I'm sure you will agree and these are like a certain brand of potato chip. You can't stop after just one! Luftwaffe Advanced Aircraft projects to 1945, Vol 1 by Ingolf Meyer, Midland, 2006. My thanks to Cape Hobby & Gift for providing the preview kit. You can only get this kit direct.